The parish of Gwernaffield (or in full Gwernaffield y Waun) was gazetted on 13 December 1844, having been created from the townships of Gwernaffield and Hendrebiffa - both of which had been in the parish of Mold until that time. In 1865, part of the township of Gwernaffield was transferred to the new parish of Rhydymwyn. This is the second church on the site. 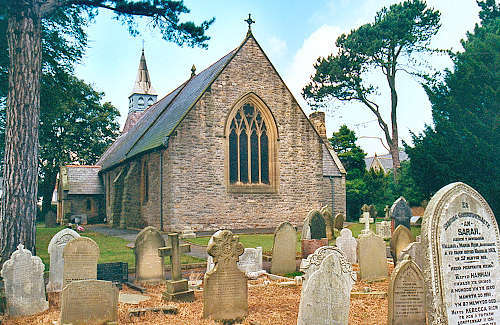 The first building was consecrated in 1838, as a chapel of ease to the Parish Church of Mold. In 1860, the church was severely damaged by arsonists, who also stole Â£13-11s-9d (thirteen pounds, eleven shillings and ninepence) from the premises. The first building was demolished in 1871, and a new church was built on the site - this was consecrated on 22 August 1872. For family history information about the church and parish, visit the GenUKI Gwernaffield page.